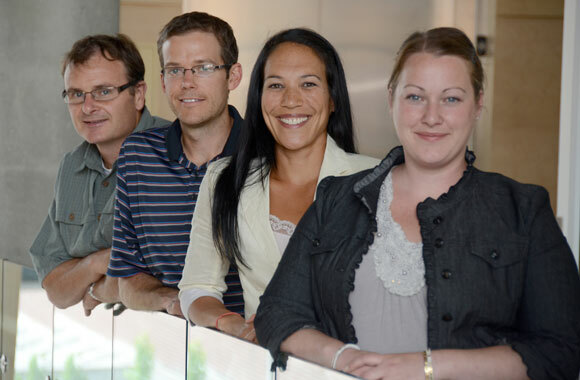 Gareth Jones, left, Jonathan Little, Mary Jung and Deanna Gibson will be speaking on obesity during a free symposium Sept. 30, 8:30 a.m. to 12:30 p.m. at the Clinical Academic Campus Lecture Theatre, first floor, 2312 Pandosy St.
It’s a growing problem with serious health implications and a panel of experts from University of British Columbia’s Okanagan campus will be giving advice on how to tackle obesity. Weighing In: Current Scientific Evidence and Community Perspectives on Obesity, will be a half-day symposium led by multiple experts from a variety of fields. It will showcase research initiatives to reduce adult obesity, highlight community experiences in addressing obesity and explore advances and challenges related to improving healthy living with obesity. It will also provide an opportunity to build community-based research partnerships on obesity. In addition to the panel of UBC experts -- Gareth Jones, Jonathan Little, Mary Jung and Deanna Gibson -- Jay Wortman, senior medical advisor with Health Canada’s First Nations and Inuit Health Branch and Glen Cross, a participant on CBC’s documentary Village on a Diet will also be presenting. The symposium will be held Sept. 30, 8:30 a.m. to 12:30 p.m. at the Clinical Academic Campus Lecture Theatre, first floor, 2312 Pandosy St. Admission is free and participants can participate in person or by web cast. Go to http://www.ubc.ca/okanagan/ihlcdp to register for this event and for more information. Obesity is a risk factor for many chronic illnesses, particularly heart diseases and diabetes. As one of the leading causes of preventable illness and death in Canada, obesity is an epidemic. In British Columbia, the 2007-2008 self-reported obesity prevalence estimate for the Okanagan was 14.6 per cent - more than double of that in Richmond and Vancouver.